who’s leading the non-car renaissance? that the strongest correlation with non-car use is belonging to his trademark Creative Class. This will not be breaking news to anyone who's worked in transit for more than 15 minutes. Before we make policy based on regression analyses like this, we need to think about which of these factors are durable, and which are ephemeral. As a transit network planner I feel much more confident basing my designs on long-term stable things like density, rather than ephemeral things like what the current generation seems to want. More importantly: if "creative class" simply means "relatively educated and open-minded people who are more adaptable than average," then of course they are best suited to non-car modes. Any growing trend relies on early adoption, which by definition is done by more open-minded and adaptable people. So a claim that a transit renaissance is led by the "creative class" is almost a tautology. 13 Responses to who’s leading the non-car renaissance? Umm…I know Richard Florida loves to toot his own horn, and I know that he can tend to be correct in many aspects, but someone really needs to call him out on his definition of Creative Class. It is just too loose. The definition is always given in very fuzzy terms. That is fine for a philosophical argument, but once you start using words like “correlation” and “regression”, or even just “tend”, your definition has to be more solid. Without clearly defining what is in vs out of the creative class, we fall into the trap of defining it however is most convenient at the moment. I have seen Florida-apologists use the term interchangeably with words like “Democrat”, “Progressive”, “Gay”, “Young Professionals”, “Creative Professional”, “Entrepreneur”, and even “Hipster”. But I can’t imagine correlating transit use with hipsterism, or energy consumption with homosexuality. Take me for example…how would he define me? I’m an entrepreneur (Creative Class! ), conservative (Not Creative Class! ), young (Creative Class! ), supply chain professional (Not Creative Class! ), pro-gay-marriage (Creative Class! ), religious (Not Creative Class! ), etc. And while I’m sure he would love to consider me a Creative Classer when trying to correlate with income, he would just consider me a conservative, religious, supply chain professional whenever he wanted to try to demonstrate a correlation with energy use. Without a real and immutable definition, his scientific arguments don’t really hold water. Interesting. They are probably also leading the inner-city renaissance and bicycle renaissance. The one thing that would be most encouraging would be a correlation with younger cohorts, since of course they are likely to make up a growing share of the population as time goes on. It would be interesting to see the extent to which young people today are more likely to prefer travel without cars than young people of previous generations, and how much this preference stays with them over time. I know there have been some studies claiming that there is such a trend, but it would be useful to see how robust it is, and whether there are further interventions that could improve it. After reading a bit about it, I’m with Danny in being pretty skeptical of the “creative class” idea. And I’m with Jarrett in being really skeptical of trying to plan much around them. Something like the “creative class” might be leading the new online fascination with transit. Certainly the “creative class” is overrepresented in transit blog communities because it’s overrepresented almost everywhere on the Internet. For that reason, when paying attention to social media, transit agencies should probably be careful not to cater *too much* to a group of people that happens to be very vocal online. I’m with both Danny and Jarrett. The whole creative class argument is a way of making certain yuppies feel better about themselves (“upper class” conjures privilege, “creative class” conjures personal qualities), and trying to tailor transit to their stated special needs produces downright awful results. Transit tends to serve commuters going where?… Downtown. What sort of jobs do you tend to find downtown?…. business, finance, legal, media, retail, health, educational, fashion etc etc. What sort of people would you then be likely to see on commuter transit?…. Before cars, when most employment, retail, and recreation activities where located in or around city centres, you probably would have had a much broader range of people riding transit. The ‘creative class’ could now be considered the last remaining market for CBD commuter transit -but we can call them ‘early adopters’ if you want to. Ed O. Yes, in the early 20c, business in general was more regimented and less automated, which means it was full of incredibly rote and uncreative jobs. So yes, the downtown jobs are more creative because the rote jobs have fallen away. 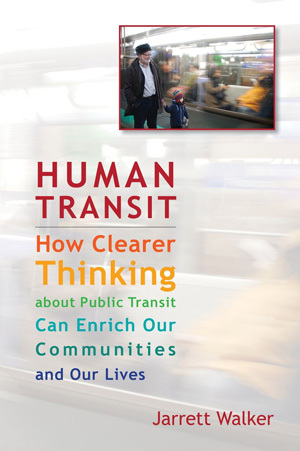 But of course transit is about a lot more than jobs; I'm interested in the strong frequent networks that can be created only if we don't think in class terms — not even creative vs rote — but concentrate on appealing to the largest possible segment of the population with the most efficient (and therefore most abundant) possible network. If I have a specific interest in the creative class, it's because they (along with resourceful low-income people) are most likely to choose to sell their car and embrace a lifestyle based on other modes, but they'll only do that if transit is sufficiently versatile — not just for the commute. A simple lifestyle-circumstance often precedes a more complex one. Combine a simple (or minimal) lifestyle with an emerging paradigm for urban living, and we see why the city is viewed by some as a kind of playground, to be best enjoyed bodily, hands-free, and unencumbered by personal equipment. While creativity sometimes requires this, fitness is more often the requirement. I would like to add that among educated (or resourceful) pedestrian-oriented transit users, I detect a psychological profile for individuals who are uniquely resilient to the “herd”. Such nonconformists might refuse a car without hesitation and no political agenda–as readily as pay little attention to what others may or may not think about their personal appearance. My guess is this behavior has less to do with intellectually derived choice than thought. For now, it’s probably acceptable to view “Creatives” as a catch-all for a mesh of interrelated types. Jarrett, I honestly think that many of the types of jobs that are no longer serviceable downtown are still serviceable by transit, and quite efficiently. I will give the example of a very automated yet still blue collar manufacturing plant that I happen to visit regularly. At 120,000 square feet, it has a worker density of 900sf per worker, which is much lower than the density of your average office facility (about 4x as much, when factoring in public space such as conference rooms and hallways). Most network designers would scoff at the idea of servicing a bunch of low density manufacturing areas like that. But this plant, and about 20 others in the industrial area near it, all have activity 24/7, year roung, with workers rotating out evenly at every hour. Sure, the density isn’t as great, but anybody who tries to run buses efficiently would love that kind of consistency. Unfortunately these plants are out in a distant industrial park, after being zoned out, condemned out, eminent domain-ed out, or taxed out of their previous inner city Cleveland locations, which makes it difficult to service. Hey…land use will always matter. Unfortunately, I think these types of biases (“The creative class is driving ridership!”) lead to the kind of transit provision that is exemplified by the Cleveland HealthLine…nice frequent service in the flashy urban areas that disappears completely as soon as soon as it reaches the first blue collar neighborhood (east Cleveland). Ten years ago, that might’ve been true. But you just have to look at most YouTube comments to see that the internet has filtered down to the rest of us. Most of us would have been thrilled to be considered a “cultural creative”, only a few years ago. Home › Journalism › who’s leading the non-car renaissance?